When we first traveled to Iceland in 2007, a day excursion to the Westman Islands (Vestmannaeyjar) would have been very time consuming. 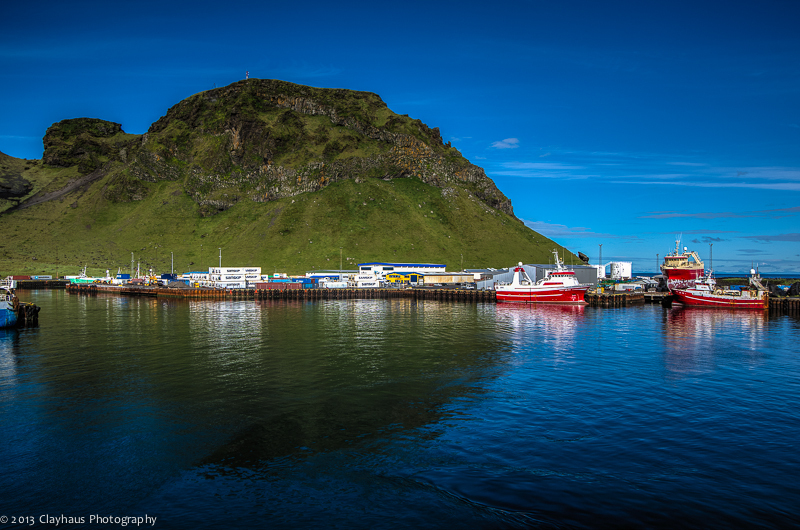 Until recently the only ferry that ran to the islands departed from Þorlákshöfn. This small port is close to Reykjavík but quite distant from Vík, a picturesque fishing village from which on a clear day, the islands can be seen. I remember them appearing tantalizing close, but wondering why there was no closer ferry, especially since the main land comes within 11 km. The Icelandic gods must have read my thoughts for in 2010 they built a ferry at the closest tongue of land and rather than taking the almost 3 hours from the original port, the journey across from Landeyjahöfn is a mere 30 minutes. This coupled with the relatively short (~1 hour) drive from Vík (where we choose to stay a second time) meant that a day trip to the Westman’s was eminently doable. 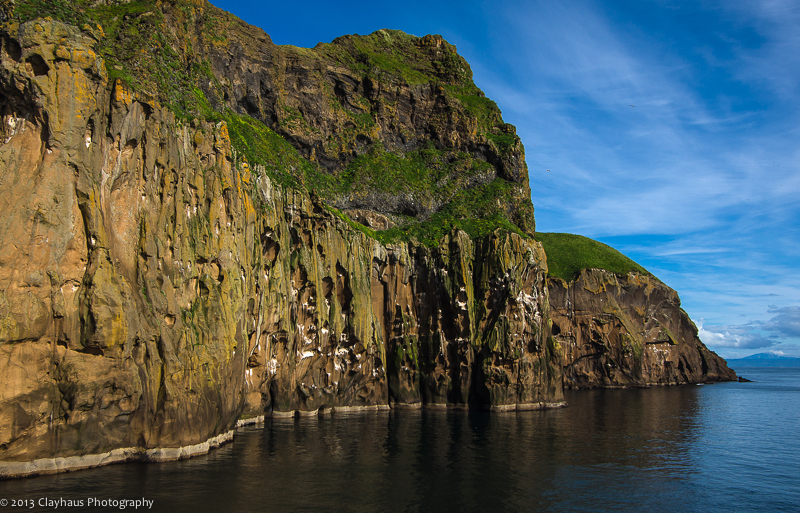 Vestmannaeyjar (“Islands of the West Men”) is named for early Irish slaves brought by the Norsemen. (Never mind that Ireland is actually east of Iceland….the early Norse had very rudimentary GPS.) As in most saga-esque stories from the Settlement Days (Iceland was first settled in the 9th century by migrating Norsemen), somebody got pissed and killed someone else and then someone else’s family took revenge and killed the original somebodies. (Though many of the Icelandic Sagas can be reduced thusly, the joy in reading them lies with the twists and turns of the modi operandi.) In this case, around 875 A.D., the Irish slaves of one Hjörleifr Hródmarsson, reacted strongly to being mistreated (as is wont to happen), revolted and killed him. 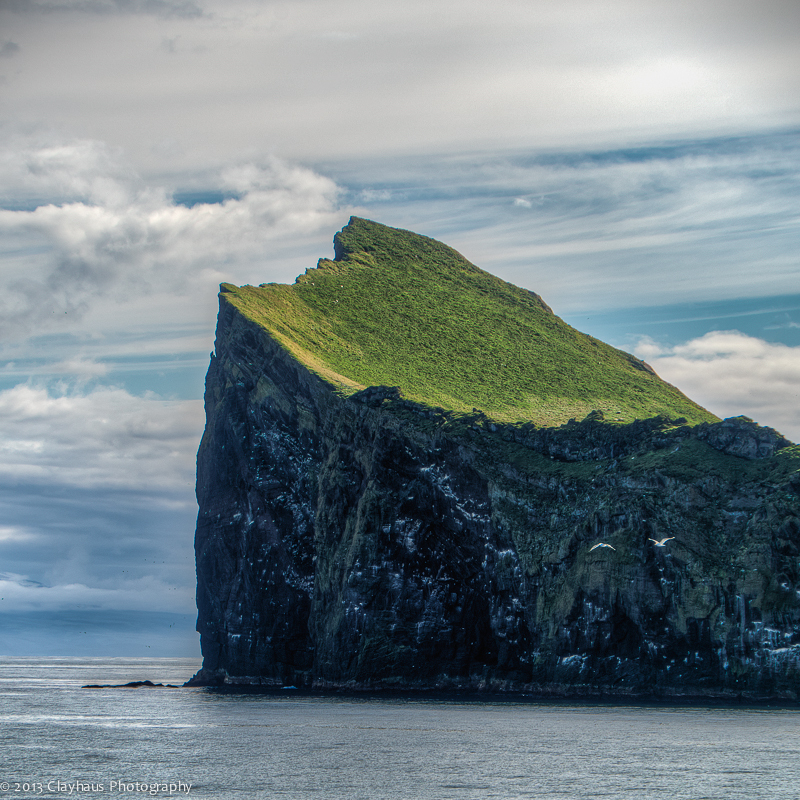 They then fled to Vestmannaeyjar. No happy ending here, of course, as Ingólfr Arnarson, is both the first reported Norse settler of Iceland, and, unfortunately for the self-freed Irish, also the blood brother of Hjörleifr. You can see how this would be played out, no? Vengeance is mine, sayeth the Norseman, and indeed Ingólfr and his troop set sail for the islands and proceeded to slaughter the West Men. 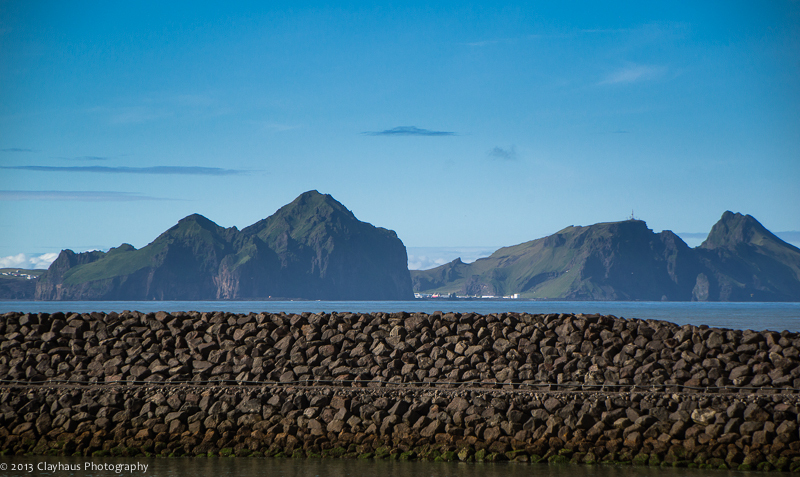 From then on, the small island chain became Vestmannaeyjar. Comprised of 15 proper islands and an assortment of sea stacks and skerries, the islands were created relatively recently by the combined efforts of some 70-80 volcanoes, both above and below the sea. Indeed the newest island, Surtsey, was birthed in 1963, whilst the main, largest, and only inhibited island of Heimaey (“Home Island”), had its last eruption in front of the world’s cameras in 1973. The inhabitants of the island — all 5000 of them — were evacuated as the lava flow consumed about half of the main and only town on the island. Our goal today, once we arrived, was to wander the port town, climb the volcano that caused such mischief and perhaps even a second, older, but taller one next to it. First we had to get there. If you want to take your vehicle to Heimaey you may, though it costs much more than if you pay as a pedestrian. Also, with the island being merely 5.2 square miles in size, a car seemed unnecessary. The 30 minute voyage was both pleasant and for a photographer, a visual treat. 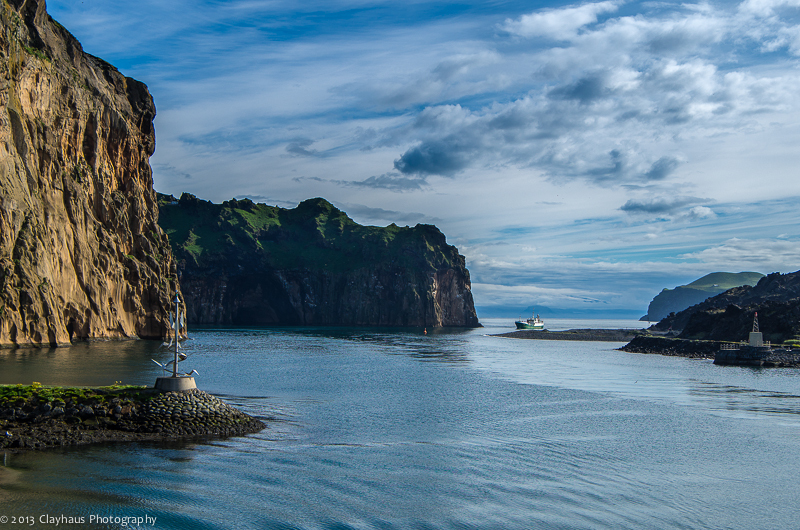 The ferry skirts two small islands, Elliðaey and Bjarnarey, both featuring improbably located lodges high above cliffs but on sprawls of vivid green turf. 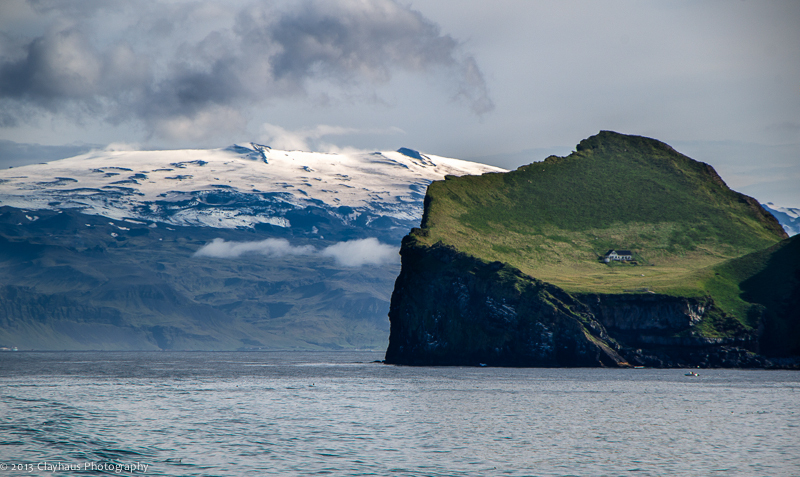 Approaching the harbor of Heimaey, from the port side you can see just how close the 1973 eruption of Eldfell came to closing the port, thereby stranding the townspeople. The lava flow actually reduced the harbor neck quite significantly, as evidenced by the blocks of encroaching black basalt. I was more enamored with the view of the starboard side, however. 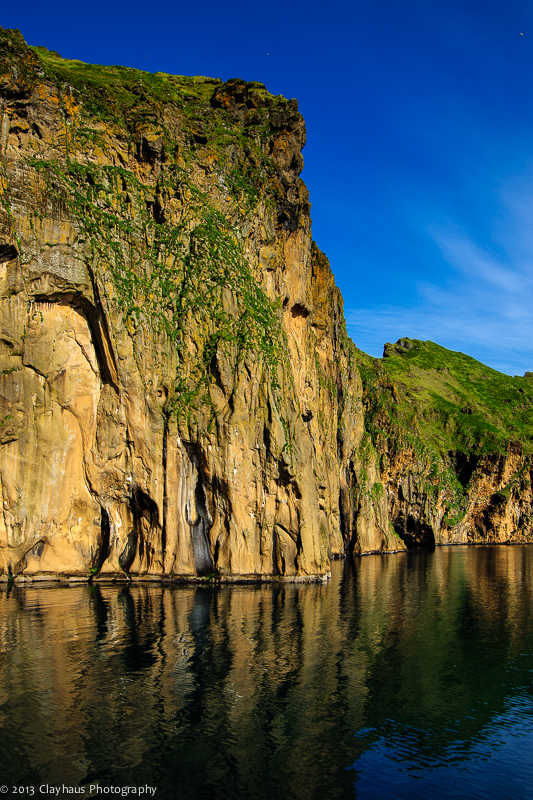 We came quite close to the mass of high cliffs that make up the low but very steep mountains of Heimaklettur and Yztiklettur. The rock has been weirdly eroded and you can spot sea caves. 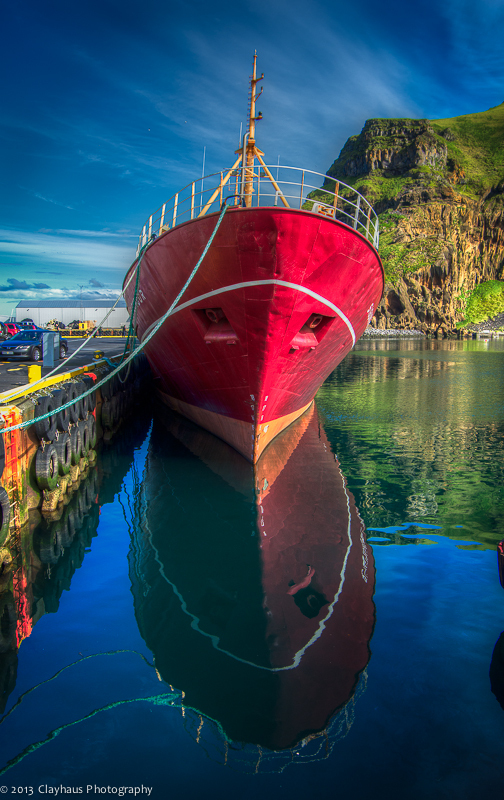 They make great photographic subjects, as does the port itself, with its multi-hued ships and boats. Just gorgeous photos of what must be a gorgeous place. I am greener than the turf in these pictures with envy. It must be quite awesome to visit. Just a note on the possible origin of name. 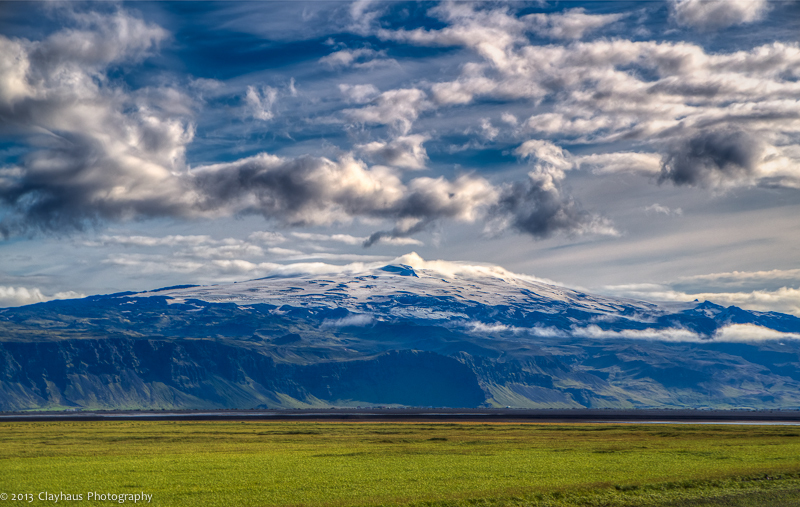 Although Ireland is east of Iceland, it is west of Scandinavia, so the name “West Men” may have been given to the Irish, not by the Norse after they arrived in Iceland, but previously when they sailed from Scandinavia. I don’t know that that’s true, but it makes geographic sense, and seafarers probably knew east from west and north from south, else they would sail off into that portion of the map where the caption reads: “Here be monsters.” Be that as it may, many, many thanks for sharing these stupendous photos and your splendid travelog. Bliss for armchair explorers. Thanks Roy for taking the time to read and reply. You supposition about the origin of “West Men” could well be correct. Despite my tongue-in-cheek-ism about the Norse not having GPS, it is no doubt more likely that they are far the better natural navigators then most modern folks walking/driving about with their GPSes. In fact, I believe that the devices have made us more dependent on not knowing our way around or how to read maps!